Pademangan Barat Urban Village, Pademangan, North Jakarta targets to build three inorganic waste banks this May. Those three waste banks will be built at RW 02, 10 and RW 11.
" 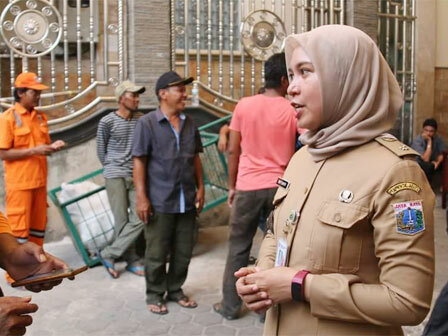 We target each waste banks to have at least 50 customers"
Pademangan Barat Urban Village Head, Dini Paramitha Sapaty said, one of three waste banks has been built at RW 02 last week. "Our target is to operate all waste banks this month. Actually, we want to inaugurate all of them at the same time, but since waste bank at RW 02 is ready, then we put it first," she mentioned, Monday (5/21). He explained, waste bank is targeted to be placed in densely populated settlement. Waste bank existence is expected to improve people's welfare besides solve waste problems. According to her, inorganic waste collecting is expected to encourage housewives to be more productive. Thus they can support their family's economy by earning money from waste collecting. "We target each waste banks to have at least 50 customers," she affir med.